INTERNATIONAL CONFERENCE "THE BALKANS IN THE NEW MILLENNIUM" STARTS. A two-day international conference "The Balkans in the new millennium", organised by the Macedonian Academy of Arts and Science (MANU), Mediterranean Laboratory Foundation, and Macedonian Ministry of Environment and Urban Planning, started Friday in Skopje. Gjorgji Efremov, president of MANU, opened the conference saying that the Balkans is going through a tragic chapter of its history even now, at the beginning of the new millennium. Macedonian Prime Minister Ljubco Georgievski was also present at the opening ceremony. Efremov added that the Balkans left the 20-th century in exactly the same way as it entered into it, in wars, bloodshed, destruction, tragic division of nations and countries, and constant rewriting of national borders. Macedonian President Boris Trajkovski addressed the conference and pointed out that we entered the new millennium with hopes for happier future, welfare, and prosperity, but unfortunately the Balkans are faced with the ghosts of the past once again. "The current events in Macedonia point out to the fact that we are still far away from final resolving of certain disputes and conflicts in the region. Those conflicts at the same time present a great threat to the world peace, because the historic rivalry has turned the Balkans into the biggest storage of weapons in the world" Trajkovski said. He added that the new challenges, and the danger spreading in the region, call for joint action, cooperation and solidarity. "All of us need new and original ideas on the path we have taken, leading to Europe and the 21-st century" President Trajkovski said. Addressing the conference participants, President Trajkovski expressed his great trust in the immense power of science that possesses the virtue of transforming the world, making it either a perfect place to live or just a toy in the human hands. "Let us all forget and left behind the things that separate us, and let us reconstruct all that binds us together in a new, mutual future of the Balkans " Trajkovski said. Boutros Boutros Ghali, Secretary General of the Francophone Community, Peter Drent, president of the European Association of Academies, and Macedonian Minister of Environment and Urban Planning also addressed the conference participants. TRAJKOVSKI: THE ALBANIAN POLITICAL LEADERS OUGHT TO RENOUNCE THE AGREEMENT. President of the Republic of Macedonia Boris Trajkovski expressed his deep disappointment from the information about the contacts and agreement signed by the leaders of the PDP - Imer IMeri and the DPA - Arben Xhaferi and Ali Ahmeti, self-declared political representative of the so-called "NLA", a terrorist group that represents a threat for Macedonia. President Trajkovski warns that these contacts are unacceptable and on the contrary to his and Government's commitment not to negotiate with the terrorists. President Trajkovski once again underlines his recommendation to the Macedonian and world public: "the goal of the terrorists is to divide Macedonia, and our response is unity." President Trajkovski considers that with this meeting, the Albanian leaders have increased the risk of division. President Trajkovski concluded that the international community shares his opinion. "The world stood with Macedonia in the renouncement of the results from that meeting, the president said. "Under these circumstances, it is absolutely necessary for the Albanian political leaders to renounce the agreement and to clearly show to the terrorists that they will not be allowed to participate in the decision-making for the future of Macedonia. If they do not do that, it will not be possible to work together. I accept that maybe the PDP and the DPA leaders made a wrong estimation, but they must fix that. Only then we will have an opportunity for progress and for finding joint solution through the political process," President of the Republic of Macedonia Boris Trajkovski said in regard to the meeting between Xhaferi, Imeri and Ahmeti. PM GEORGIEVSKI: MACEDONIA HAS NO OTHER RIGHT BUT TO WIN ON EVERY FIELD. "I think that the platform signed in Pristina can be analyzed from several aspects. The first aspect refers to the fact that we gained new platform and new political demands, which have increased for 30% in comparison with was agreed among the Macedonian President, the political parties, US President Bush and EU Representative Solana," Macedonian Prime Minister Ljubcho Georgievski stated prior to the meeting of the Macedonian top officials and military leaders regarding the agreement on cooperation and joint action between DPA and PDP leaders Xhaferi and Imeri and the self proclaimed political representative of the so-called National Liberation Army, Ali Ahmeti. According to him there are seriously dangerous elements, and some of them even have military background, such as the request for serving the Army in the place of birth. "That means they will strike back with military attack after a year of preparations," Georgievski added. Besides the radical requests, very important element is that we have unique political platform of two legitimate parties in Macedonia with one terrorists i.e. paramilitary group. "One thing is clear: the Albanians has gone step further than the usual practice between the terrorists and their political wings, such as IRA or the terrorist from Baskia, who do not have legitimate relation with the political wings," PM Georgievski said. He emphasized that in Macedonia the terrorist i.e. the paramilitary groups have joined the legitimate political parties what is a disastrous situation for the country. Georgievski believes that there is a space for apologizes by the Albanian political parties. "We saw that they do not apologize and their position strengthens. The signing of the agreement and it declaration seriously dramatizes the overall political and security situation in Macedonia," the Macedonian Premier underlined. Asked whether the Macedonian Government will accept the so-called NLA as a negotiating partner, Georgievski answered that the politicians have united with the terrorists and there was no space for negotiations. "In this situation not only there is no space for further discussions but it is suggested that the Macedonian security forces have to defend the country merciless as we are facing very organized enemy," Premier Georgievski explained. Asked about Imeri's statement that the Government knew about the signing of the agreement, Georgievski said that perhaps Imeri referred to his ministers in the Government. "I assume that his ministers in the Government knew about it, but the Macedonian Premier and President knew nothing about it," Georgievski said. According to Georgievski, it is good that the OSCE special envoy Rober Frowick has left Macedonia as he has kept the Macedonian Government in illusions for about a month. "Anyway his role is still unknown and unclear. Suddenly no one is behind him," Georgievski stated. "It is very clear that Macedonia should not wait any longer in order to protect its territorial integrity and the Macedonian security forces should clear the terrain around Kumanovo. We should be very careful, but the freedom and the territorial integrity should not be compromised. Our territories are occupied and we have to defend them," Georgievski stressed. Georgievski thinks that the international community tried to dissuade Xhaferi and Imeri from their ideas and signatures, but "it did not happened." Asked whether he feels betrayed by his coalition partner, Georgievski explained "in the past for years there were several combinations SDSM and PDP, VMRO - DPMNE and DPA and now all four parties are in the same coalition." "Xhaferi has been always committed to his principles and he does not feel that he betrayed someone. But we also have our own principles, which are stronger at this moment. We are defending our country. Someone wants to occupy our territory and we have to defend our principles. I believe that Macedonia and the Macedonian nation has no other right at this moment but to win on every field, diplomatic and political, and unfortunately we have to fight," Macedonian Prime Minister Ljubcho Georgievski stated. Macedonia Re-establishing of the relations with China. Macedonian Foreign Minister condemned Friday the declaration of ethnic Albanian political leaders in Macedonia and self-declared political leader of so-called National Liberation Army (NLA) Ali Ahmeti. Leaders of the Albanian political parties PDP, Arben Xhaferi and DPA Ymer Ymeri with act of signing of the agreement are promoting Ahmeti as an official political partner, and they included him in their political platforms. With that act Xhaferi and Ymeri became protagonists of the Ahmetis goal - isolation of the legitimate Albanian representatives in Macedonia, said to the press Macedonian Foreign Minister Ilinka Mitreva, Friday. She added that additional time should be given to the leaders of the Albanian political parties PDP and DPA to see whether they will renounce the declaration. Macedonian Government can not accept terrorists as negotiators, said Mitreva. She noted personal and party position (SDSM), that change of the Constitution is unacceptable. Mitreva confirmed that Special Representative of the OCSE President, American Ambassador Robert Frowick was asked to leave Macedonia, because his work was opposite to the action of the OSCE mission in Macedonia. Macedonia will not give up from the right of its Constitutional name in international institutions, said Mitreva. But, did not exclude the possibility for alternate name of Macedonia in bilateral communication with Greece. Mitreva announced that Macedonian Foreign Ministry is preparing the memorandum for normalization of the relations between Macedonia and the Peoples Republic of China. Macedonia claims success over rebels. An army said government forces had recaptured the northern villages of Vakcince and Lojane, and Rudnicka Colonija, a smaller village between the two. When the army entered Vakcince and Lojane, it found them empty, said government officials. "Everyone has gone, the civilians and the rebels," said interior ministry spokesman Stevo Pendarovski. Vakcince has been the army's main focus About 2,000 people poured out of the rebel-held area on Thursday night, heading north into Serbia. About 1,000 more left Vakcince on Friday, escorted by police on foot for 5km (three miles) over fields and then taken in buses to safety. "We decided that we had to leave, there was no other choice," said one civilian. "Everyone was coming out. We were not organised. We just saw people leaving and we joined them." 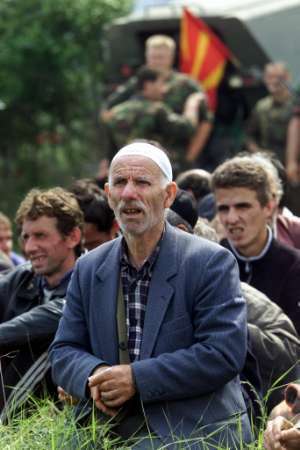 Confident words The government had repeatedly urged villagers to flee ahead of the military action, anxious to maintain international sympathy and avoid radicalising moderate Albanians. The government had urged people to move to safety "Saving the civilians' lives is the biggest victory of the campaign so far," said government spokesman Antonio Milososki. "Not only are we liberating the villages that were occupied, but we succeeded in getting 2,000 civilians to pull out,"
The civilians, visibly exhausted, were treated by local ambulance crews. Police separated the men from the women to screen the males for those suspected of rebel involvement but said most of the refugees would be free to go. Several more villages further south remain under the control of the rebels. Defence Minister Vlado Buckovski said once the civilians were gone it would be "easy to handle the terrorists". Political row The army launched its offensive on Thursday as a political storm broke over a secret move by two ethnic Albanian political parties to negotiate directly with the rebels. The row threatens to break up the governing coalition, with Prime Minister Ljubco Georgievski accusing the two party leaders involved of taking their parties "into a terrorist organisation". The move by Arben Xhaferi of the Democratic Party of Albanians (DPA) and Imer Imeri of the Party for Democratic Prosperity (PDP) to sign an accord on "common action" with the rebels provoked international condemnation. The deal offered the rebels amnesty guarantees and a right of veto over decisions about ethnic Albanian rights, if they agreed to stop fighting. Both the rebels and mainstream ethnic Albanian parties want to see a change to the constitution which would give Macedonia's large ethnic Albanian minority the same status as the majority Slavs and make Albanian an official language. Dozens Reported Dead in Macedonia. VAKSINCE, Macedonia (AP) -- Rebels and army artillery gunners exchanged fire on Friday, as government forces moved further toward the center of a northern insurgent stronghold. Dozens were reported killed. The move on Vaksince was part of a major government offensive unleashed Thursday meant to push the rebels out of a string of highland villages close to Macedonia's border with Kosovo. 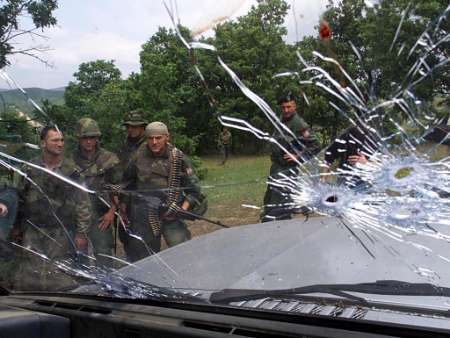 Col. Blagoja Markovski, an army spokesman, spoke of brief overnight clashes in several other northern areas, but the main conflict focused on Vaksince on Friday. Puffs of smoke rose from the village center, marking detonations of army artillery shells close to the mosque, and heavy machine gun fire punctuated the boom of the cannons. The insurgents responded with submachine gun and other small-arms fire. 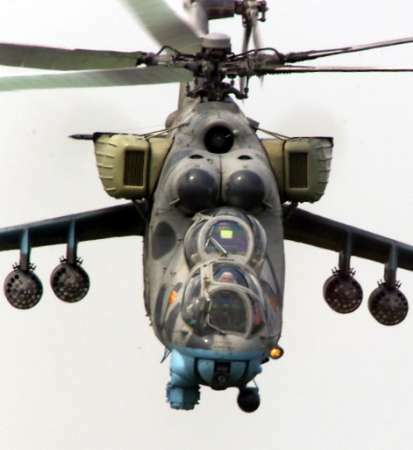 Two helicopter gunships swooped low, their rotors clattering, fired a string of missiles and let loose bursts from 20-mm cannons, before flying off. Government tanks then started firing. By noon, the mosque's slender tower was toppled, and government troops were firing mortar rounds -- normal procedure ahead of an infantry onslaught. Small arms fire was heard from neighboring villages. Commenting on unconfirmed reports of up to 60 civilians killed by recent fighting in the region, a police official, who spoke on condition of anonymity, confirmed the likelihood of dozens of deaths. But he denied they were innocent victims, calling them ''terrorists'' -- insurgents dressed as civilians to evade detection. He had no further details. Up to 2,000 refugees crossed into Serbia at Miratovac, close to the Macedonian border, said U.N. refugee agency officials in Geneva. 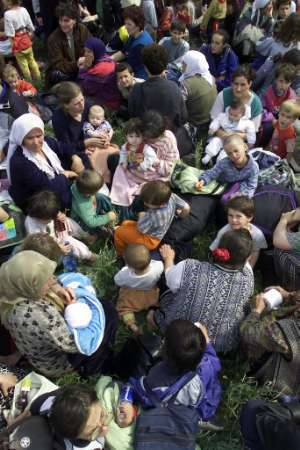 They were being accommodated in Bujanovac and Presevo, at private homes and refugee centers. In Skopje, the capital, government officials sought to avert political crisis, caused by revelations Thursday that ethnic Albanian parties in the government coalition secretly negotiated a peace deal with the insurgents. Slavic parties in the coalition condemned the agreement, which threatens to split the government along ethnic Albanian and majority Slav lines. That, in turn, could doom efforts at ethnic reconciliation, polarize Macedonia's two nationalities and lead to all-out war. The deal provided that the rebels would agree to stop fighting in exchange for amnesty guarantees by the ethnic Albanian coalition partners. The rebels would also get the power to veto political decisions about ethnic Albanian rights. The government opposes negotiations with the rebels and rejects including them in the political process -- stances supported by the United States, the European Union and other Macedonian allies opposed to investing the rebels with legitimacy. Prime Minister Ljubco Georgievski accused the ethnic Albanian parties in his coalition of openly merging with the rebels, declaring: ''Albanians are siding against (Slavic) Macedonians. But Imer Imeri, head of the ethnic Albanian Party for Democratic Prosperity, suggested his party had dealt with the rebel National Liberation Army with government approval. ''The government was encouraging us to approach the NLA and we did it for peace,'' he said. Arben Xhaferi of the Democratic Party of Albanians refused to renounce the deal but said his party had ''never acted behind the government's back,'' adding his group was not seeking to leave the governing coalition. Senior Western diplomats in Skopje were expected to pressure the two Friday to distance themselves from the deal, condemned in a U.S. Embassy statement as a ''totally unacceptable ... effort to bring this insurgent group into the state structures.'' ''There should be no accommodations made for violence or violent groups,'' said the statement. The European Union said the rebels had ''no place at the negotiating table. NATO Secretary-General Lord Robertson rejected the deal in similar language. Fighting erupted in February. The guerrillas say they want more rights for ethnic Albanians in Macedonia, who make up as much as a third of the 2 million population. The government accuses them of trying to grab land and unify it with neighboring Kosovo, which is also dominated by ethnic Albanians. SKOPJE, Macedonia (AP) - A secret peace deal to end Macedonia's insurgency is threatening to scuttle the country's emergency government coalition by splitting it into Slavic and ethnic Albanian components. If the government fails, it could doom efforts at ethnic reconciliation, polarize Macedonia's two nationalities and leave no option but all-out war between the two sides. The crisis broke Thursday amid major advances by army units fighting the ethnic Albanian rebels in the northern highlands, including the taking of their village stronghold of Vaksince. The peace deal, confirmed Thursday by diplomats and politicians, was secretly negotiated this week between senior officials of the ethnic Albanian parties in Macedonia's government and rebel commanders. It provided that the rebels would agree to stop fighting in exchange for amnesty guarantees by the ethnic Albanian coalition partners. The rebels would also get the power to veto political decisions about ethnic Albanian rights. Leaders of Slavic parties in the coalition government expressed outrage that their coalition partners had secretly negotiated with the rebels. The government opposes negotiations with the rebels and rejects including them in the political process - stances supported by the United States, the European Union and other Macedonian allies opposed to investing the rebels with legitimacy. Prime Minister Ljubco Georgievski accused the ethnic Albanian parties in his coalition of openly merging with the rebels, declaring: ``Albanians are siding against (Slavic) Macedonians.'' But Imer Imeri, head of the ethnic Albanian Party for Democratic Prosperity, suggested his party had dealt with the rebel National Liberation Army with government approval. ``The government was encouraging us to approach the NLA and we did it for peace,'' he said. ``Peace is very near.'' Arben Xhaferi of the Democratic Party of Albanians refused to renounce the deal but said his party had ``never acted behind the government's back,'' adding his group did not seek to leave the governing coalition. A U.S. Embassy statement condemned the deal as a ``totally unacceptable ... effort to bring this insurgent group into the state structures.'' ``There should be no accommodations made for violence or violent groups,'' said the statement. The European Union said the rebels had ``no place at the negotiating table. NATO Secretary-General Lord Robertson condemned the deal in similar language. Fighting erupted in February. The guerrillas say they want more rights for ethnic Albanians in Macedonia, who make up as much as a third of the 2 million population. The government accuses them of trying to grab land and unify it with neighboring Kosovo, which is also dominated by ethnic Albanians. Seven killed as Macedonia steps up rebel assault. Macedonian artillery pounded ethnic Albanian villages yesterday as the country's emergency coalition government struggled to survive a new crisis. 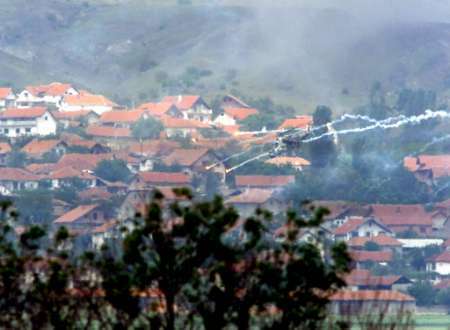 An Albanian guerrilla commander said that Macedonian army shelling had killed seven civilians and wounded at least five others. Earlier, a senior western diplomat left the country after his attempt to clinch a peace deal with the rebels through ethnic Albanian coalition leaders was denounced by the government's Slav majority and the EU as "extremely damaging". Ethnic Albanians in rebel-held villages, subjected to heavy shelling, issued a call for urgent medical help. Rebel sources said they had reports that shells had hit a civilian shelter in one village. In stark contrast, 4,000 Yugoslav troops moved without resistance into a nearby strip of southern Serbia which was vacated by ethnic Albanian guerrillas this week in a Nato-brokered deal. Less than 20 miles to the south, the hills of north-eastern Macedonia were shaken by tank fire and shrouded in smoke. Commander Shpati, a National Liberation Army (NLA) leader, said: "This is the fiercest shelling we have withstood so far. We have unconfirmed reports that shells have hit the shelters." A humanitarian agency said it was impossible to send a team into the Macedonian village of Slupcane, a guerrilla stronghold, because fighting was continuing. 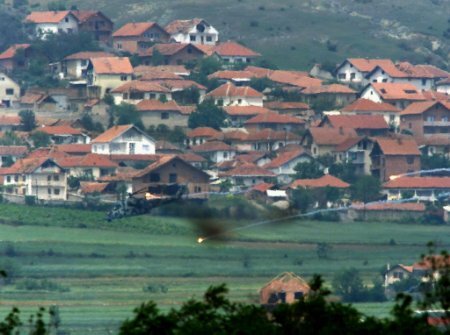 Orizare, Vakcince and other ethnic Albanian villages held by guerrillas for the past three weeks, despite frequent bombardments, were also under attack. The battlefield lies just a few miles west of the main Athens-to-Belgrade highway. In a major setback to Macedonia's unity government, forged 11 days ago, it emerged yesterday that Albanian political leaders had made a peace deal with NLA rebels in secret talks involving a western diplomat. The deal was apparently brokered by the special envoy of the Organisation for Security and Co-operation in Europe (OSCE), Robert Frowick, of the United States. The European Union and the UScondemned the deal with the guerrillas, who Brussels accused of committing "terrorist acts". An EU statement said the deal should be torn up. "We can only guess at the pressures which may have led representatives of PDP and DPA to sign this document. But we call on the two parties to renounce the document in a way which shows no ambiguity," it said. Diplomatic sources said Mr Frowick had left the country, adding that: "It is necessary that he should go." His initiative had been "extremely damaging", they said. Shot fells leader of Albanian militia. RIDVAN Cezimi, a popular Albanian rebel leader known as Commander Leshi, was killed by a sniper yesterday afternoon in southern Serbia. Albanians suspect Yugoslav security forces in the killing, while the Yugoslavs say it was the result of a dispute within the ranks of the disbanding rebel army. A CNN crew had its camera smashed when it arrived to film hundreds of ethnic Albanian mourners gathered in front of Cmdr Leshis headquarters. The shooting occurred just days after a peace agreement was signed by the rebels, ending a bloody year-long conflict that has claimed several dozen lives. It threatens to unravel a delicate peace agreement that took months to forge with the help of western diplomats. More than 4,000 Yugoslav troops returned yesterday to most of the security zone that separates Serbia from Kosovo. Cmdr Leshi was shot in the last remaining section of the security zone known as sub-sector centre, scheduled to be erased on 31 May. The three-mile-wide zone was established at the end of the NATO bombing campaign to separate Yugoslav and NATO forces, but the area soon became a stronghold of the Liberation Army of Presevo, Medvedje and Bujanovac, or the UCPMB, named after the three largest towns in the Presevo valley. The guerrillas were supplied from Kosovo and crossed the US-controlled border with impunity. While Slobodan Milosevic was in power, international peacekeepers looked the other way, enabling the rebels to grow to a force of several hundred. In the deserted village of Gornja Susaja, Yugoslav troops yesterday found weapons, uniforms, crates of ammunition, tents from international humanitarian organisations, boxes of medication, live chickens and dry food. Kosovo peacekeepers ultimately solved the problem they helped create. Under intense pressure from the international community, the UCPMB agreed this week to lay down its weapons, 18 months after it made its appearance at a funeral in the village of Dobrosin. A fierce battle in the village of Oraovica last week sent the rebels a signal that the international community would allow the Yugoslav army to engage rebels in areas populated by civilians. For Albanian leaders in Kosovo, the relatively small guerrilla army in southern Serbia became a political liability. Kosovar leaders are focused on elections this autumn that will allow self-governance for the first time since the United Nations began running the protectorate. Many ethnic Albanians are disappointed by the rebel armys demobilisation and NATOs decision to phase out the security zone. "These soldiers are the same ones who were responsible for human rights abuses in Kosovo. Our village is now militarised and the children are scared to go outside," a farmer in Oraovica said. Albanian leaders say thousands of Albanians who do not believe the assurances of Belgrade and NATO have fled to Kosovo ahead of Yugoslav troops. The deputy prime minister, Nebojsa Covic, said Yugoslav troops have the authority to search Albanian homes for weapons. As part of the peace agreement, the international community is insisting that Serbia correct the mistakes of the past and make drastic improvements in its treatment and policy towards ethnic Albanians. Monitors from the European Union are closely watching the armys behaviour. A key component in improving relations between the two communities is the formation of a multiethnic police force that has begun training under the auspices of the Organisation for Security and Co-operation in Europe. Some 400 Serbs and Albanians will eventually patrol villages together, in groups of two, after completing intensive training programmes. International organisations are pouring in money to pave roads, rebuild schools and improve infrastructure in the long-neglected region. In Belgrade, the return of Serb troops to the buffer zone is being perceived as an important political victory for Yugoslavias democratic reformers led by the president, Vojislav Kostunica. "We have re-established co-operation with NATO and are changing the image of Serbia created during the Milosevic regime," said Biserka Matic Spasojevic, Yugoslavias ambassador to Macedonia. The remaining rebels have one week to hand over their weapons. Cmdr Leshi had planned to wear his uniform until 30 May, then come to Bujanovac to have a coffee. "He was a good man who believed in peace and negotiations. This is a tremendous tragedy," an Albanian journalist said. While bracing for the worst, locals hope that the wording on brightly coloured banners lining the streets will come true: "We dont want our children to die. We dont want to spend the rest of our lives in hatred." Life gets harder and harder for those few Serbs remaining in Kosovo. "And now," cried the singer, "let's have a song for the Macedonian army!" His small orchestra struck up a tune, the Serbian audience sprang to its feet and belted out the song with wild enthusiasm. It was about midnight in the Obala restaurant at Gracanica, one of the last Serb enclaves left in Kosovo. The singers were rejoicing at the offensive then being waged by Macedonian troops against Albanian guerrillas around Tetovo, some 60 kilometres to the south. The Kosovan Serbs had little direct interest in the neighbouring conflict, but they celebrated nonetheless, in keeping with the time-honoured principle of "the enemy of my enemy is my friend". It was a moment of rare merrymaking for the Gracanica Serbs who live surrounded on all sides with towns and villages populated by hostile Kosovo Albanians. At the centre of Gracanica stands a medieval monastery greatly revered in Serbian culture but the beleaguered local Serbs take little comfort from it. Every day, more and more people flee Gracanica, tired of paying the price for the policy of Serb supremacy conducted by Slobodan Milosevic over the past decade. They find scant comfort in the presence of Swedish soldiers from K-For who guard access roads and thoroughly check those entering the village. The villagers know that Albanians hold them responsible for everything they suffered in the days when a Serbian minority dominated Kosovo under the protection of Milosevic's troops and police. The Albanians have many ways of showing hostility. The Serbs know it's no accident that their power is cut several times a day and their telephone lines disrupted. As one Gracanica resident put it, "If the lights are on at night in surrounding Albanian villages and we have no electricity, it's perfectly clear what's going on." To enter Gracanica you go through barbed wire and sandbags at the checkpoint guarded by Swedish soldiers. Many houses in the village flaunt inscriptions in Cyrillic script proclaiming, "This is Serbia". Small shops along the main street display goods from Serbia, items you will find nowhere else in Kosovo. They provide everything needed for daily existence but because of transport costs the prices are beyond the reach of many poor villagers. The cheapest can of beer costs three German marks, fresh salads in the Obala restaurant cost seven marks and a modest dinner for six people comes to 350 marks, more than you would pay at one of the best restaurants in Zagreb. All this is way above the general price levels seen in Kosovo. Gracanica Serbs stubbornly refuse to acknowledge the reality of their plight. On their decrepit cars, they sport licence plates marked with a PR (for Pristina) accompanied by a small Serbian tricolour. This makes them virtually prisoners in their own enclave. Outside it the plates would instantly label them as Serbs and therefore targets for unwelcome Albanian attention. The normal licence plates for Kosovo, as prescribed by international authorities, are marked with a KS. Asked why he would not accept such a plate, a Gracanica villager replied bitterly, "No one will take offence to the letters PR in the places we will travel to". He meant Serbs will not stay in Gracanica for long and that their only destination will be Serbia. Nearly every morning, cars loaded with all they can carry set out for Serbia, escorted by K-For vehicles, never to return. No one could say for sure how many Serbs remain in Gracanica but their numbers dwindle all the time. "I don't know myself what I'm actually waiting for, " said one villager. " I don't know whether I can put up with this much longer. I feel as if I were kept in a cage. How on earth can I explain to my children that I can't go anywhere from here." He was a Serb who came here from Croatia after being driven out in 1995 by the Croatian army's "Operation Storm" offensive. After two years of moving from one refugee camp to another, he came to Kosovo where the Milosevic regime had promised he would be generously treated. Now he feels like a hostage. Unlike the man from Croatia, most Gracanica Serbs were born here and consider Kosovo to be their fatherland. The legend that Kosovo was the cradle of Serbian nationhood is so deeply imbued in them that they feel departing Gracanica would be not only a personal tragedy but an act of national treason. "I have never done wrong to anyone and I don't know why I should leave this place," said an old man wearing a traditional Serbian cap. "And yet, there is no life for me here. This has become Albanian land and there's no place for Serbs in it." Next day in the heart of Pristina, on the porch of a cafe patronised mostly by the international community, I met a young Italian who found out I was a journalist from Croatia. In an urgent whisper, he warned me not to utter a word in Croatian because it sounded too much like Serbian. "Anything resembling the Serbian language may be very dangerous here," he said. "A Bulgarian was murdered here some time ago because his language was mistaken for Serbian." I had heard such warnings in Croatia as well, before I flew to Pristina. Nonetheless, as soon as the receptionist saw my passport in the lobby of the Grand hotel, he spoke to me in a mixture of Serbian and Croatian. I had felt sorry for a taxi driver whom I tortured with my English on the way from the airport to the Pristina hotel. Had I addressed him in Croatian I would no doubt have paid less than the 40 marks which was his extravagant price for driving English speakers on the 20-minute ride in his old, rust-eaten Mercedes. It is not difficult to imagine the feelings of the few hundred Serbs remaining in Pristina. They don't dare speak Serbian on the street and most of them don't know the Albanian language. No wonder they find life unbearable. Dragutin Hedl is IWPR's project editor in Croatia. Kostov's Macedonian visit proves fruitless. Prime Minister Ivan Kostov visited Macedonia on Friday in an attempt to help mediate the Macedonian crisis. He offered suggestions to the government to arrive at a compromise and asked the Albanian side to present peaceful intentions. However, Ilinka Mitreva, Macedonia's new Minister of Foreign Affairs, suggested that Kostov would be better off focusing on matters in his own country - such as the upcoming elections. Vladimir Kisyov, Bulgaria's Deputy Foreign Minister, suggested that the country's parliamentary elections could be postponed if the situation in Macedonia escalated. However, President Petar Stoyanov stressed that the elections should in no way be connected to Macedonia, and any postponement could have dire consequences for democracy in Bulgaria.